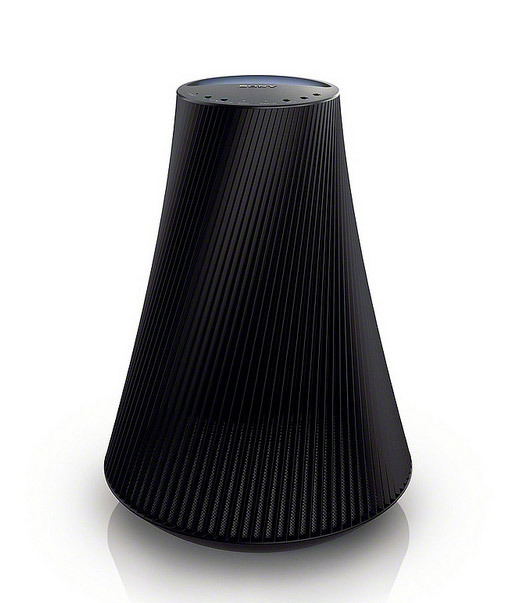 HERE’S A WIRELESS speaker system that’s not likely to be mistaken for any other. 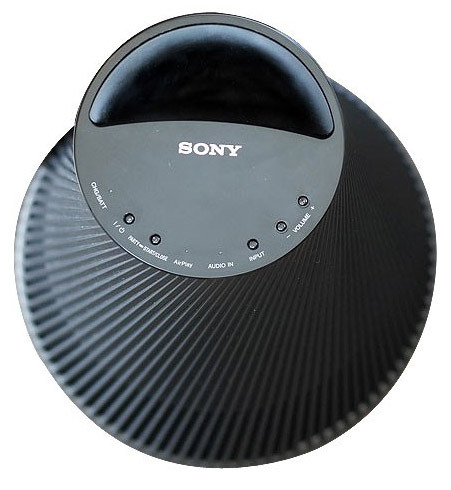 The strange looking shape of Sony’s entry into this product category actually makes a lot of sense when you consider that the NS510 could find itself in any number of positions, from a shelf in a small room to a table in a big room to an outdoor area. Accordingly, it’s designed to radiate sound all around rather than fire it in any specific direction. To this end, it’s a two-way, five-driver system with four outward-firing tweeters and a central downward facing woofer that vents at both the top and bottom of the unit. The top vent is cunningly designed to form a comfortable carry handle, so the system is easy to lug around and at 4.2kg, it’s not an unwieldy burden. It’s powered by a built-in rechargeable battery, which is claimed to offer two hours’ playing time at peak volume and five hours at half volume. Connectivity options include wired 3.5mm and Ethernet inputs or Wi-Fi – so you could theoretically plonk the NS510 in a room, hook it up to power, plug in an Ethernet cable and you’d be sorted – but that’d just be silly, as it’s a portable device after all. Once I had it set up and talking to my router (which is a simple process despite some typically cryptic statements in the user manual), I found that I was lugging it all over the place and listening to it while doing ironing, washing the car or just fiddling with something, somewhere round the house. While I did stream music to it from my Mac using Airplay and tried it using a 3.5mm cable from my iPod Classic, I usually just used my iPhone to control the NS510, either playing songs straight from my music collection on the phone or streaming from the SHOUTcast Internet radio app. There’s also a free App from Sony that allows you to stream music from network drives or Sony’s own music services, as well as move the music to multiple compatible speakers or even put them all in Party mode, where they play the same tune. I had zero issues with dropouts – as long as I was in range of my router and not too close to the edge of the reception area, streams to the NS510 were rock solid. Top mounted controls make it easy to adjust the volume if your streaming source isn’t close to hand; there are also LEDs to indicate the battery’s charge state and the unit’s connection to the network. Sonically, the NS510 is a bit of a strange device because it’s affected by room position; more so than any other small speaker system I’ve ever used. The treble is reasonably open and extended, while the midrange is sweet. The four tweeters mean that the upper frequencies sound pretty much the same wherever you are, but the low bass is schizophrenic, depending on the device’s placement and/or your own. The bass is weighty but somewhat over exuberant – Sony claims a frequency extension of 60Hz and that’s believable. Most similar devices are tuned to have a bass hump to give them the weight they need to have some impact, which is exactly how the NS510 gets down low. 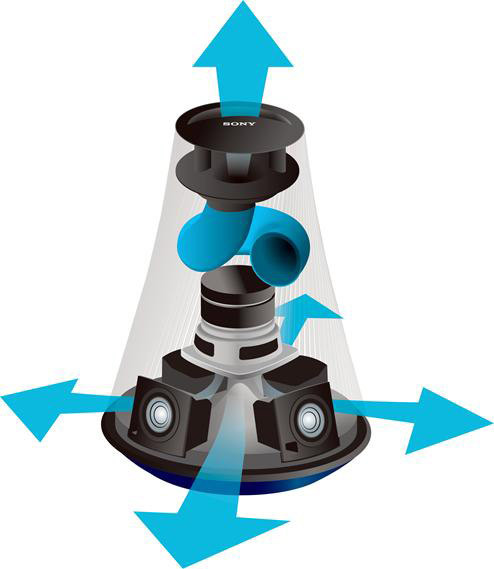 However, the low end can become boomy and overbearing if you or the speaker are in the wrong place. Not a big deal generally, because you can just move it – for example, on the small table in my lounge, it booms like an unruly walrus, but move it to the kitchen counter and it’s fine. The hassle comes when there are multiple people listening; those on the left may be happy, the others on the right may want the volume lowered to cut the annoying bass. This isn’t as much of a problem outdoors because there are no room boundaries for the NS510 to interact with. Still, at least you can shift it if the bass is deemed troublesome. I generally got at least a day of regular (if not consistent) use from the NS510 because my volume levels tended to be low. At higher levels, I found I could still get four to six hours of use, but no one will ever need to worry about the battery life at full volume because the NS510 distorts badly when the volume is pushed to the max – around 80 percent is plenty, and that’s still loud enough to keep a deck full of people happy, although this unit won’t power a dance party. You should get at least two hours of sound at high volume levels – whether that’s enough to get you through your event is debatable, so bear that in mind. Stand-by time was around two days, so the NS510 will need to be plugged in on a regular basis. Placed correctly, the NS510 can make some very enjoyable music – I found a sweet spot in my bedroom that had the right bass balance, which meant that while there was still too much low end, it wasn’t annoyingly loose and wobbly. Running a high quality stream on SHOUTcast while I was reading proved the perfect way to while away a Sunday evening. And when it was time for supper, I just took it to the kitchen.